"Sabrina! Sabrina come over here sweetie!" Sabrina, a young girl who couldn't have been more than 4 years old, ignored her mother's calling. She was much more interested in the dandelion she'd found by the sidewalk than the protest she'd been brought to. 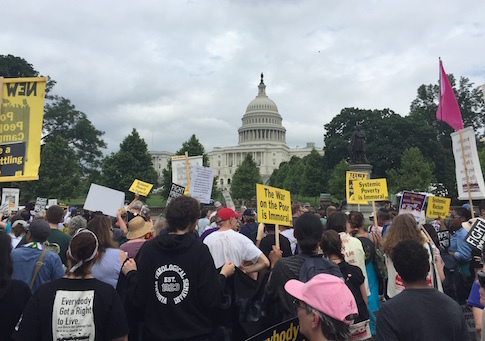 Participants in the Poor People's Campaign's march on the Capitol continued to walk by, waving signs decrying everything from fracking to mass incarceration, and Sabrina's mother eventually stopped and went back for her daughter. Curious as to what prompts someone to bring her young child to an event like this, I walked up and asked her just that. "I want her to understand," she responded, "part of being a good citizen is knowing you have the right to protest." 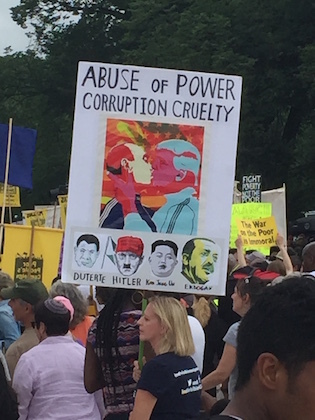 The protest had started on the National Mall a few hours before, although it might be more accurate to say it had started 40 days before, on Mother's Day, which marked the kickoff of the Poor People's Campaign. Participants had spent those 40 days serving in various ways, staging sit-ins, blocking traffic, and engaging in civil disobedience. Today was the grand finale—a march on the Capitol Building to express displeasure at the president and Congress. Before heading out on the roughly two-mile trek, the several hundred marchers got fired up with speeches from the event's leaders and funky, jazzy renditions of protest chants led by the Justice Choir. "Say fight the power!/Fight the power!/Say fight the power!/Fight the power!/Say fight the power that be!" was the most common refrain. Though "Ain't no party like a poor people's party cause a poor people's party don't stop" proved popular too. The crowd was filled with people of all races, genders, and ages, and they eagerly chanted along with the choir while waving signs like, "We are a new unsettling force," "Ecological devastation is immoral," and "End the war games in South Korea." The rebooted Poor People's Campaign is, as many reboots tend to be, a bit jumbled and fails to find a balance between old and new material. The protest has nearly 40 demands, many economic, but with social issues comprising a rather large portion of the list—things like statehood for D.C. and an assault rifle ban and voting rights for felons. The lack of a unified goal was occasionally apparent during the march. One protester said she thought Malcolm X had the right idea when it came to guns, and that the poor should arm themselves to protect themselves. Another told me that the purpose of this protest wasn't to turn Congress blue, while not far away people shouted, "Hey hey, ho ho, the GOP has got to go." Later I spotted a woman, standing just a few feet away from demonstrators carrying environmental and antipolice signs, smile and ask a policeman standing by a trailer on the route if he would please throw away her plastic water bottle in the trashcan behind him. Various intersections had been closed off to keep the streets clear for the march, but aside from that, life seemed to continue as normal. Some people stared as the parade went by, but most just went about their business. Pedestrians cut through the parade to cross the street and tourists snapped a few pictures—just another D.C. sight to remember. Many took pictures of the "Protest Princess," an actress who had showed up dressed as Sleeping Beauty. She'd started out at the front of the march, but had drifted back—walking in heels, not to mention a petticoat and dress in 80 degree weather, had taken a toll. She was late for the rally because, fittingly, she'd slept in. The princess explained to me, in character, that she was protesting because, "Well, Sleeping Beauty was asleep for so long while a dragon ruled her kingdom. Maleficent didn't curse me, she actually came to warn my parents of the economic conditions." "What I want to say is that 75 percent of Americans make less than 50k in a year," she continued, slipping out of character. "Fifty percent of Americans make less than 30k in a year. Forty percent make less than 20k. Meanwhile Jeff Bezos makes 30k in a second, more than I have ever made in a year. Gross! And that is pretty disgusting, I mean we're all worth more than a second." The march eventually reached the Capitol, where a Trump impersonator wearing a sign that read "Heart of I.C.E." welcomed the crowd. The purpose of the demonstration, an Episcopalian priest told me, was to "[go] to the Capitol now to take our demands there." But once they reached their destination, the marchers shuffled on past, a few taking photos with the Capitol as the backdrop, and headed back to the Mall. As they turned away from the Capitol, some of the protesters started chanting, "When human rights are under attack, what do we do?" "Stand up, fight back," came the response, as they walked away. This entry was posted in Politics and tagged Protests. Bookmark the permalink.